As well as being the premier supplier of limestone products in the midlands, Mannion Quarries offers a wide range of supplementary products and services. We travelled to the company’s central base at Belnamulla – approximately ten kilometres from Athlone and 15km from Ballinasloe – to get an insight into this long-running operation from quarry manager Enda Hughes. 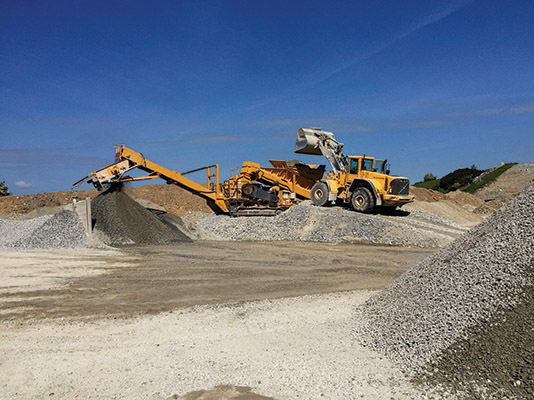 From their well-appointed quarry at Bealnamulla, Athlone, Mannion Quarries supplies a range of crushed limestone products to the agricultural, construction, civil engineering and roadways sectors. They also supply sand and gravel products as well as keen truck / plant hire, site clearance and crushing & screening services. Very much a customer-orientated business, Mannion Quarries has come a long way since it was founded two decades ago by Michael Mannion, developing an unrivalled reputation for delivering high-quality products and services on time and at a reasonable price, forging strong ties with a large number of longstanding customers, including Roscommon County Council and Westmeath County Council. The quarry was rich in limestone and Michael decided to mine it. He was soon doing business with a host of local authorities, builders and farmers alike. The full range of crushed limestone products available for either collection or delivery includes: Clause 804; Maintenance; Quarry Dust; Drainage Chipping - varying sizes; Specialised Chipping for driveways; 2-6" Down Stone; 3-6" Clean Stone; Crushed Gravel; Pit Run Gravel; Washed Sand and Topsoil. While the economic downturn wreaked havoc with everything even tenuously connected to the construction industry, Mannion Quarries tightened their collective belts and weathered the storm, coming out the other side as a stronger and more efficient business, currently providing gainful employment to a team of 20. In addition to a fleet of quarry machinery including primary and secondary crushers, screeners, loading shovels, excavators and dump trucks, Mannion Quarries also operate a fleet of lorries – all Volvo – delivering stone to customers all over the midlands, from Loughrea / Cappataggle in County Galway to Kinnegad on the Westmeath / Meath border. At the time of writing, Mannion Quarries was busy working on a number of prestigious contracts, supplying stone for a new service station, bridge and flyover on the M6 (Roadbridge being the main contractor), Jazz Pharmaceuticals’ new manufacturing and development facility at Monksland, Atlone and ongoing work with Roscommon and Westmeath County Councils. A keen truck hire and plant hire (crushers, loading shovels, excavators, dump trucks, water pumps etc.) service is also offered to customers in the greater Athlone area, Mannion Quarries have their own workshop, fronted by a full-time fitter, and the vast majority of preventative maintenance, servicing and repair work is carried out in house to keep overheads down and ensure customers of the best-value products and service possible. All in all, this impressive Athlone-based business has been a definite success story for the past 20 years or so and the signs are encouraging that this will continue to be the case moving forward. “Around 2009/2010, it was all about cutting back and keeping things lean and doing what we could to keep our costs down,” Enda concludes. 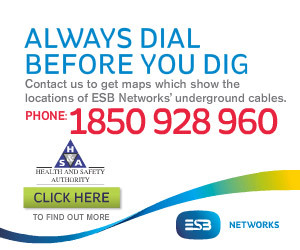 “We continue with that policy today and we continue to run a very tight and efficient operation. The success of Mannion Quarries proves that – in any line of business – a combination of good product, excellent service and keen price is difficult to beat!